My main thought for today is that there is a LOT of sand in the desert. You would think that this should be obvious. But when in Dubai, the sand is largely hidden. There are a very few empty lots which are bare sand, but almost all of the land is covered with either buildings or immaculately manicured landscaping. Every median is covered with green grass bordered by yellow and orange marigolds, huge marigold plants which add up to probably millions of individual marigold blooms in the city. Dubai consumes more water per capita than maybe anywhere else on the globe. 97% of the water they use is desalinated sea water. This technology has allowed the city to transform the desert into a lush landscape with gardens everywhere. 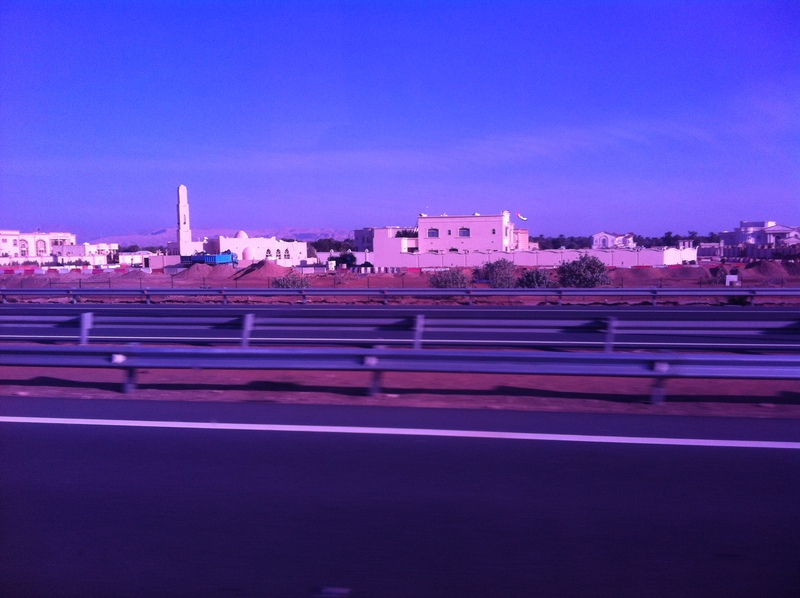 But we left Dubai today, and there is quite a stretch of desert between the largest city in the UAE and the oasis city of Al-Ain which will be our home for almost two weeks. We have not had time to explore the city here, but we experienced more authenticity in the first three minutes of arriving than in all the time spent in Dubai. 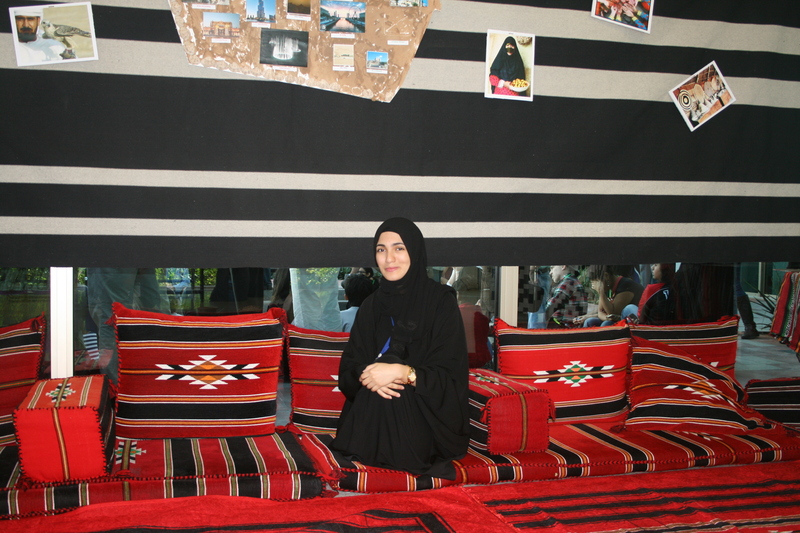 One of our sweet dorm hosts — she is a student here at UAEU. Well, actually, I felt like I was back in the south until I went to dinner. In the process of securing our spot on the number three bus from Dubai to Al-Ain, we missed out on lunch and thus headed for dinner in the cafeteria a few minutes early to try to be at the front of the line. (Thank you Sarah for the tip!) When the doors opened, there was a mad rush for the trays and silverware, followed by jostling to secure a salad and a place on the line to reach the hot foods: bodies pressed against each other, Drew exclaiming, “my head doesn’t have any room!”, and me blocking out the chess dad so that I could let Zoe and Drew slip in ahead of me. A large man pushed Ganmama aside with a gruff, “sorry,” to skip the salads and head straight to hot food. Another “gentleman” moved the silverware cart so that he could cut across from his line into ours. Memories from a long ago trip to Budapest came to mind — difficulty reaching the counter at McDonald’s — but I have watched plenty of football since then so I was prepared this time. Chess parents are indeed a breed of their own. But before I leave this post, I have to go back for a moment to the sand in the desert. 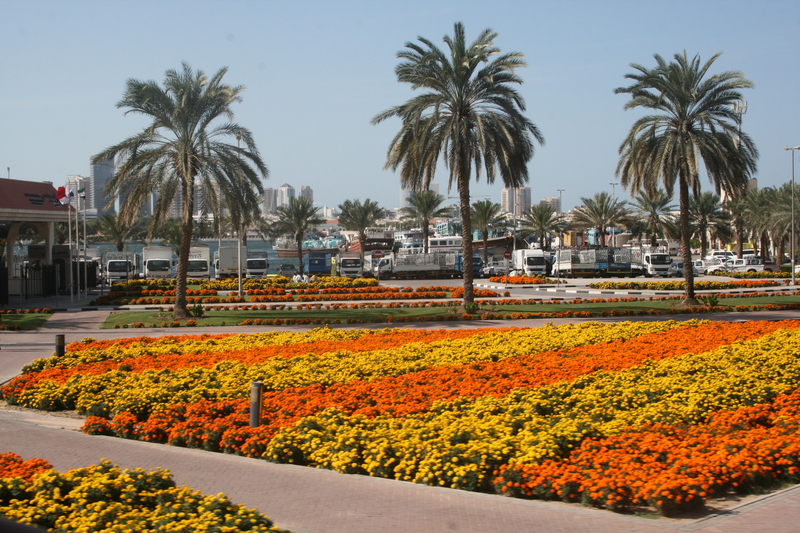 The flowers in Dubai remind me of a book I read back in high school, Hinds Feet on High Places by Hannah Hurnard. The flowers are beautiful, but sometimes what is good is not best. Hopefully tomorrow Drew will look past the good move that he sees and find the best one. What an amazing opportunity. We’ll be praying for Drew! Hi everyone! Due to your mom’s exquisite writing skills, I feel like I am there with you! Thanks for sharing with us and continue your pursuit of the King, Drew! Praying for you! Mrs. B. Sending lots of Good Luck from Georgia!